I deny that God was, or ever could be, fully revealed as one. He is one; but He never was revealed as one. He was made known to be one in contrast with a multiplicity of gods, but then He was not fully revealed. He existed always in trinity in unity - not that I pretend to fathom this, but I know it, because, when fully revealed, He is so revealed. When He was made known as one (Deut. 6:4), He did not suffer Himself to be approached, only by the High Priest on the day of atonement. He, typified by the ark of the covenant, dwelt (as so made known) behind the veil. In a word, He used various sensible figures to show that He was not known, that the true light did not shine, and that the way into the holiest was not yet made manifest. But when He does reveal Himself, the Son is on earth yet in the bosom of the Father. He is the image of the invisible God. He that has seen Him has seen the Father. The light of God was in the world, but man did not see or comprehend it. The revealed One, the Father, was known or to be known in goodness by the Son. Though the invisible God was made known by Him who was His image, yet if He had ceased to be invisible, Christ would have ceased to be a special revealer and image. If He had not perfectly shown and revealed Him as really manifested (that is, if He had not been God), no love, goodness, forbearance, patience, power - no revelation would have been made. If He had not been Son, He could not have revealed the Father to us as such. But this is not all. The darkness comprehended not the light. The Holy Ghost became power (when the needed work was done to put us according to God's holy and righteous nature into that place, without which He would not have been so known, that is, in truth) to give competency of apprehension, and to reveal, not as object but as communicating power, having quickened us so as to have a capacity to apprehend. I am not saying this a priori (i.e., by mere deduction) but from the revelation of God. Without the Trinity, love was not known, righteousness, holiness - the spiritual nature of God and purity as such. That is, He never was revealed as He is and always was. All the true nature of God, that is, what He is, without the Trinity is unknown. The Father wills; the Son quickens whom He will; but because we have separate wills, why necessarily have the Father and the Son? The Spirit distributes to whom He will; but this is not separate from the will of the Father and the Son. They have not the same counsel but one counsel, mind, purpose, thought; yet they act distinctly in the manifestation of that counsel. The Father sends the Son, and the Son the Spirit. Yet when the Son comes, He is not thereby separate from the Father. "The Father that dwelleth in me, he doeth the works." So He casts out demons by the Spirit of God; yet He casts them out. There is unity in all that constitutes oneness when we speak spiritually - not unity as one by arriving at the same things, or union, or by being united as we are by having only one Spirit dwelling in all, but - by being one in eternal being, so that all else flows from that one will and counsel; yet so as that distinction in action in that will is revealed to us: not distinct will, but distinct willing. Not that I have the least pretension to fathom this divine mystery where all are God, all one God, God all three; yet the Father is revealed, the Son reveals, and the Holy Ghost quickens and makes known. The Son who reveals is not different from the Father whom He reveals, or He would not reveal Him. By the Spirit who quickens and makes known, we are born of God and know God dwelling in us. He reveals Him to us by His own presence and is in every way the power of God, active in the creature. Nor could the creature reach to God; or God would not be God. It is simply impossible, for if finite reach to infinite, there is neither finite nor infinite. The infinite God could not, as such, reveal Himself to a finite creature. Nor is this mentally true only, for if God in His glory had done so, the creature could not have existed before Him. So if morally revealed (that is, as righteous and holy, and simple [in essential] glory), man could not have stood before Him. There was contrariety morally. Not even love would do, for what was it to man as he was? No link, no desire, and, if man was a sinner, no fitness in the simple display of it. But in the Son by the Holy Ghost, by the work of Christ and the operation of the Holy Ghost, God is revealed; and in the love of the Father, righteousness and holiness are maintained and glorified, with the capacity of communion in enjoyment of both the Father and the Son and intelligence of all these ways conferred by the presence of the Holy Ghost. Hence, while John says God so loved the world, we find, whenever he speaks of grace and power bringing man into the knowledge and enjoyment of God, he speaks of the Father and the Son, adding afterwards in the words of Christ the presence and work of the Comforter. John is the one who speaks specially of the revelation of God, not of the presentation of man to God, though he does this. Paul also speaks of the revelation of God, but specially of man's presenting to God. Thus we see that there could be no full revelation of God, but through the Son by the Spirit, and thereby of the Father. The full revelation of the one God is only thus-Father, Son and Holy Ghost. This, this only, is what the one God is, one identity of will and being, so that they are essentially one and one only, yet distinct in willing and acting (and we can distinguish them in willing and acting: hence we commonly speak of persons), yet never willing or acting but in the common will and unity of nature. I fear much human language on this. 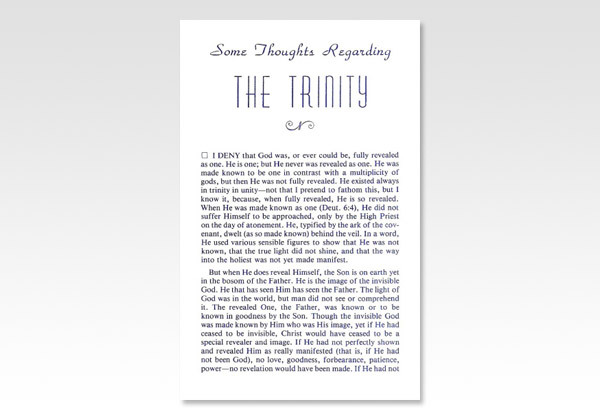 But I affirm that the only full revelation on the one true God is the revelation of Him in the Trinity. Our prayers rise up the same. Through Him (Christ the Son) we have access by one Spirit unto the Father.